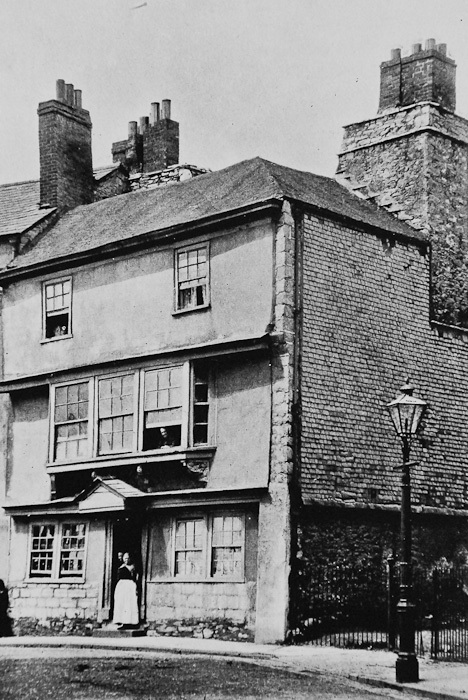 Hawker’s birthplace at 6 Norley Street, Plymouth, Devon. 1803: Born 3 December at 6 Norley Street, Plymouth. First child of Jacob Stephen Hawker, a surgeon, and Jane Elizabeth Drewitt. Baptised 29 December by his uncle, the Rev John Hawker, at the church of St Andrew with St Luke, Stoke Damerel. 1803 – 1808: Lives with his parents in Plymouth. His father, Jacob Hawker, changes professions during this period and takes Holy Orders. Jacob serves as a curate at Altarnun, later moving to Stratton. 1808 – 1818: Lives with his grandfather, the Rev. Robert Hawker DD, vicar of Charles Church, Plymouth, and his grandmother, who had cared for him as a baby. Probably also stays with his aunt Mary and her husband, Thomas Hodson, who help pay for his education (his parents have eight further children). Runs away from several preparatory schools and gets into mischief at home in Plymouth and during holidays with his parents at Stratton. Boards for a time at Liskeard Grammar School but although he shows early signs of literary promise he is unable to settle. 1819: Leaves school and works briefly for a solicitor in Plymouth but decides against the law as a profession. His aunt, Mary Hodson, pays for him to attend Cheltenham Grammar School where he applies himself more successfully to his studies and determines to become a clergyman. 1821: Publishes his first book of poems, Tendrils, under the pseudonym of ‘Reuben’. The book features several of the visionary themes which will reoccur in his later writings and clearly shows his interest in superstitions and legends, and his passionate love of nature. 1822: Maintains his determination to become a clergyman and continues his education at Cheltenham Grammar School, as well as reading widely. Lives for several months in a wooden hut on the seashore with ‘a man who was a kind of half-fisherman half-wrecker’ where he studies by himself. Reminiscing in later years he wrote of how ‘what with the situation, the novelty, and the various incidents of the day and night, I do not think I was ever happier or more occupied with interest than there’. 1823: Admitted into Pembroke College, Oxford on 28 April. Marries Charlotte Eliza Rawleigh I’ans on 6 November. His wife is the second daughter of Colonel Wrey I’ans of Whitstone, Cornwall. His father performs the ceremony at St Andrew’s church, Stratton, and the couple honeymoon at Tintagel. 1824: Returns with Charlotte to Oxford (by coach from Exeter – like much of Sabine Baring-Gould’s biography of Hawker the story of the couple travelling up to Oxford together on one horse is an invention). As a married undergraduate he is obliged to transfer from Pembroke to Magdalen Hall, where the couple entertain Charlotte’s two sisters and he acquires the nickname of ‘the man with three wives’. 1825: Composes the Trelawny ballad, ‘Song of the Western Men’, ‘under a stag-horned oak in Sir Beville’s walk in Stowe Wood’ while staying with Charlotte in a cottage in the Coombe valley, on the southern boundary of Morwenstow parish. (See Cornish Ballads and Other Poems, p.2. for this date. In Life and Letters, p. 23, Hawker gives the year as 1824). 1826: Publishes ‘The Song of the Western Men’ anonymously on 2 September in the Royal Devonport Telegraph and Plymouth Chronicle. 1827: Wins the Oxford Newdigate Poetry Prize for his poem ‘Pompeii’. Grandfather, Robert Hawker, dies at Plymouth. 1828: Awarded a BA degree at Oxford. Stays at his wife’s house at Whitstone and builds ‘a kind of log hut in the wood, a mile from any house’, where he spends his days studying for Deacon’s orders. 1829: Ordained deacon to the curacy of North Tamerton, where the Rev. Mr. Kingdon was non-resident incumbent. 1832: Records of the Western Shore published. 1833: His father, Jacob Hawker, curate at Stratton since circa 1810, is promoted to vicar. 1834: Bishop Phillpotts offers him the post of Vicar of Morwenstow; Hawker accepts. 1835: Moves to Morwenstow. Rents a small cottage as a temporary home for himself and Charlotte. 1836: Construction of King William’s Bridge at Coombe. Poems published. 1837: Begins building his new vicarage. 1842: Wreck of the Caledonia at Sharpnose Point, 7 September. 1843: Re-introduces Harvest Festival. Reeds Shaken by the Wind published. Builds a new school in the middle of the parish which he names St. Mark’s. Wins lawsuit brought by Sir John Buller over St John’s Well. Wreck of the Phoenix on 13 January and the Alonso on 28 October. Builds a hut on the cliffs using wood from these wrecks, together with that of the Caledonia. 1844: Becomes involved in an argument with the owner of The Times newspaper over the plight of agricultural labourers and the ‘unholy and cruel enactments of the New Poor Law’. 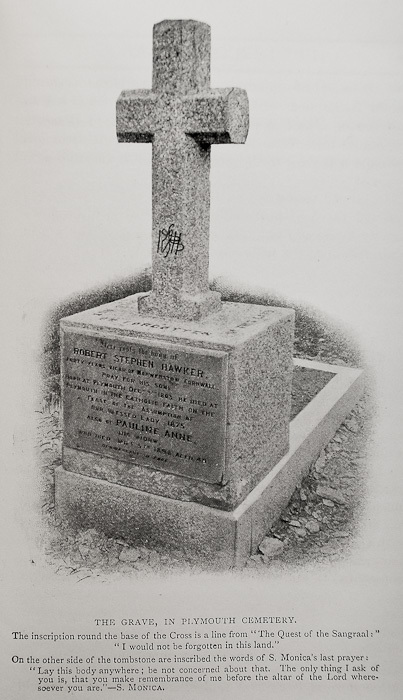 1845: Father, Jacob Hawker, dies at Stratton. Visits Oxford and is awarded an M. A. 1846: Echoes of Old Cornwall published. 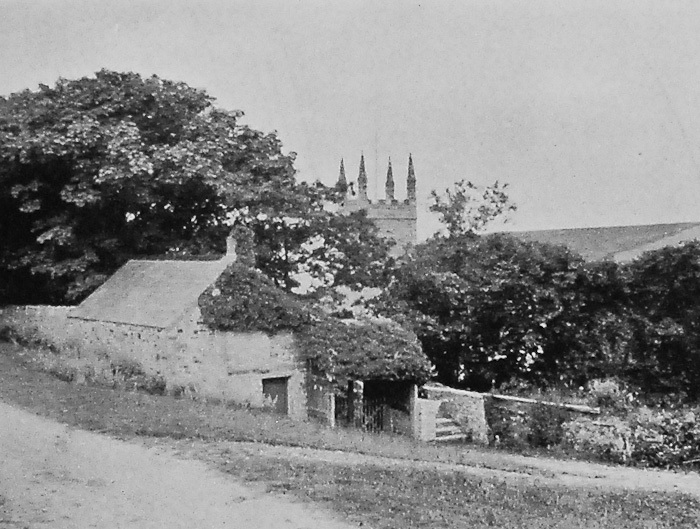 1850: Obtains the curacy of the neighbouring parish of Welcombe, to hold in conjunction with Morwenstow. 1852: Wreck of the Primrose. 1853: Wreck of the Margaret. The Lych-gate house, Morwenstow, where shipwrecked sailors were laid out for burial. 1855: Issues appeal for church roof. Begins correspondence with Mrs Harriet Watson. 1858: Wreck of the Temperance. 1859: Wreck of the Milo on the rocks southwest of his Hut. Visited by the Earl of Harrowby. 1861: The Song of the Western Men set to music by Miss Louisa T. Clare. 1862: Great storm causes damage to vicarage. Wreck of the Bencoolen at Bude. 1863: His first wife, Charlotte, dies on 2 February. Composes and publishes The Quest of the Sangraal during the following months. In August the Earl of Carlisle draws his portrait and fire damages the vicarage. In October Mr Valentine, Vicar of Whixley, Yorks, comes to stay in Morwenstow parish, bringing with him a young governess, ‘Miss Lebjinckski or some such name’, to care for his children. Wreck of the Margaret Quayle in December. 1864: Develops a friendship with the nineteen-year-old Polish governess, Pauline Anne Kuczynski. Makes his first visit to London, with the aim of persuading Pauline’s mother to agree to their marriage. Travels by train for the first time and reputedly pulls communication cord after losing his hat out of the window. Marries Pauline on 21 December at Holy Trinity Church, Paddington. 1865: First daughter, Morwenna Pauline, born on 27 November. 1867: Second daughter, Rosalind, born. 1868: Wreck of the Jeune Joseph. 1869: Third daughter, Juliot, born. Cornish Ballads and Other Poems published. Wreck of the Avonmore. 1870: Footprints of Former Men in Far Cornwall published. 1874: Wreck of the Nancy. 1875: Converts to the Roman Catholic faith shortly before he dies on 15 August. Buried at Ford Park Cemetery, Plymouth. Ford Park, founded in 1848, is a 34 acre cemetery in central Plymouth. Its official name at the time of inception was The Plymouth, Devonport and Stonehouse (Ford Park) Cemetery, although it is seldom referred to by that title any more. It is estimated that approximately a quarter of a million people are buried within its grounds. All illustrations taken from The Life and Letters of R. S. Hawker, edited by C. E. Byles. John Lane: The Bodley Head, 1906. 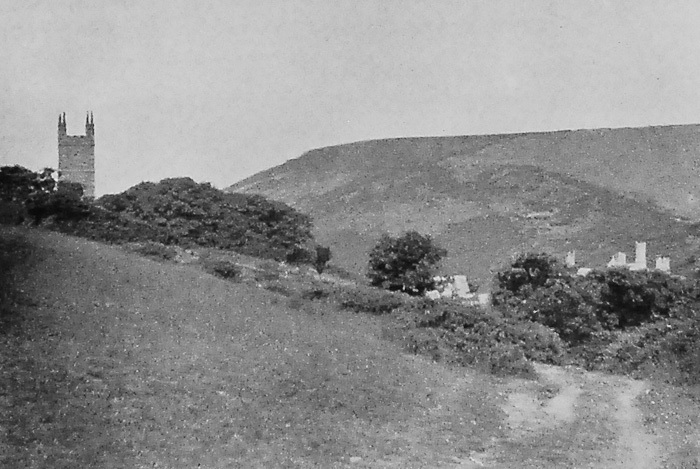 The two images of Morwenstow are from photographs by the Rev. R. A. Morris. Very thorough WIP! A labour of love, I’m sure. Do you know where the grave is sited in Ford Park Cemetery?